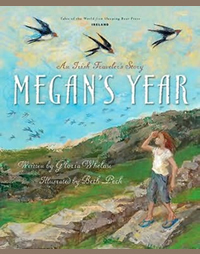 Through the voice of a young girl, the life of the people known as Irish Travelers is explored. Megan spends her summers traveling around the Irish countryside with her family. They move from place to place, hauling their camper behind their old car. But they aren't on vacation. This is their way of life. Megan and her family are Travelers. As part of their summer life, Megan's father works odd jobs, from fieldwork to roofing houses. Despite the rough living, Megan loves her life and the freedom that comes from traveling the open road. But at summer's end, when there's no more work to be had, the family moves to the city of Dublin. The camper is parked and they move into a cramped house. Megan and her siblings attend the local school as their parents struggle to make ends meet. And as the seasons pass, Megan counts down the days until she can return to her summer life.